In the North American weekend premiere of Dragon Ball Super: Broly, the anime film exceeded $17 million USD in revenue, and has become the fifth top anime film in the United States according to a Facebook post by FUNimation. The legendary Super Saiyan Broly is here and ready to exact his revenge on those who banished him after childbirth. Goku and his friends band together to take on all-powerful Broly, but will they be able to stop him and save the Earth from his terror? 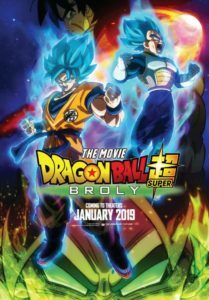 Canadian fans, don’t worry, Cineplex is still showing Dragon Ball Super: Broly. Be sure to visit the Cineplex web site for locations and showtimes.